I finished my task in about 15 minutes and I was excited to be back on my way to town. Sunglasses on my face, purse slung over my shoulder, my two phones in one hand, my car keys in the other, I went back out the way I came. This time the men were not in the room, and everything looked the same … yet it took just one foot placed onto the concrete for me to realize that something was very, very different. Imagine the most perfect of pratfalls, the classic slip on the banana peel … suddenly I was looking up at my feet and involuntarily unleashing a noise that was somewhere between a yelp and a shriek. I came down most ungracefully onto my lower back with an astonishingly loud thud. That’s right, folks. In the fifteen minutes that had passed from my entrance into the space, a very thick layer of industrial carpet glue was spread onto the concrete. The men had left it for a few minutes to become tacky, when along I came, unsuspecting and obliviously toting along all of my belongings … that were now covered in glue. The men, who were very kind, told me to quickly get up and get to the bathroom because the glue is water-soluble. The unfortunate thing about wallowing in a puddle of carpet glue is that the only way to get up out of it is to roll around in it some more so that you can position yourself to stand up without slip-sliding and falling again. Talk about adding insult to injury! As I stood up, big fat gloplets of glue dropped from me to the floor. One of the men helped to lift me out of my shoes, which were now sticking quite stubbornly to the floor, and I hurried into the bathroom, where I discovered that the glue was only kind of water-soluble. I was able to get most of it off of my hands, but it was smeared all over my arms, all over my back from my mid back down to my thighs, it was on the front of my shirt, it was all over my purse, it was on my phones, it was on my keys, it was on the remote locking device for my car, it was on my sunglasses … at least the part of my glasses that I had. I had hit the ground so hard that one of my lenses had popped out! I quickly realized that I was fighting a losing battle with the glue in the bathroom. I decided to focus my efforts on my hands, so that I could grip the steering wheel of my car without becoming one with it, and my keys so that I would not be sticking a glue key into my ignition. Having accomplished a decent enough job on my hands and keys, I came back outside where the men were waiting for me with my shoes, which they had unstuck from the floor and cleaned for me. After I assured them many times that I was OK, they cut a large scrap of carpet for me to place on my car seat so that I would not get glue all over my car. Of course, when I got home and stepped out of my car, I then had carpet stuck to me, and I wondered if the neighbors were watching (somebody should be, I thought … it really was quite funny). So … what do you do when your foot takes an unexpected step and your day ends up with you all covered in glue? First, you laugh at the absurdity of it all, and then you make a big batch of tapioca to soothe your bruised and battered self. 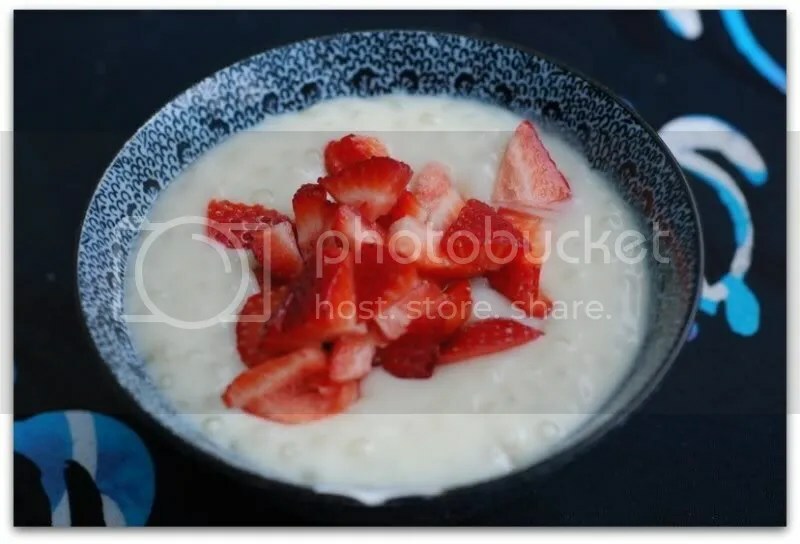 In the past month or so I’ve grown quite found of tapioca pudding but I hadn’t yet tried making it for myself. I made two different batches in an attempt to get the consistency right (traditional tapioca calls for eggs to thicken it up). For the first batch I used two tablespoons of Ener-G egg replacer, which made the tapioca quite thick. I actually really liked the consistency of that batch, but I made a second batch with a thinner consistency, which is what is listed below. 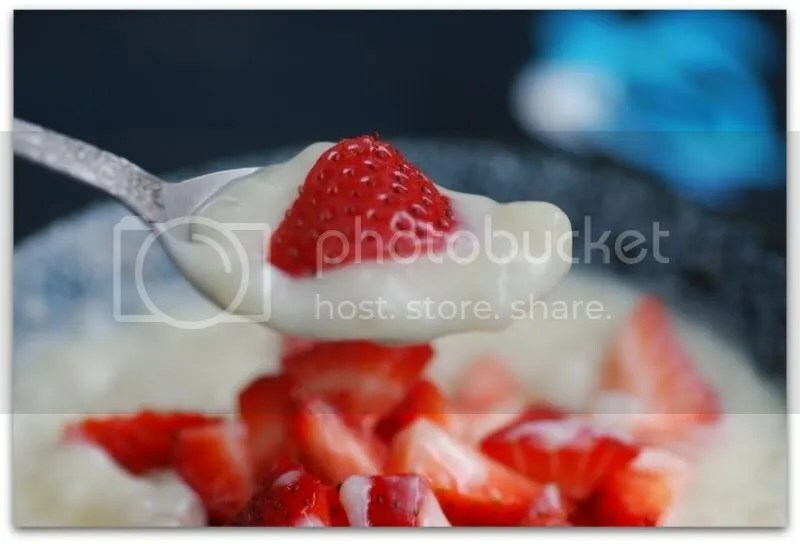 First I enjoyed my tapioca warm with sliced strawberries … then I enjoyed it again later chilled with mixed berries. Both were delicious … and both helped to make the soreness of my aching back more bearable. 2. Whisk the soy milk and egg replacer together. Whisk it into the coconut milk mixture, along with the sugar and salt, and be sure that everything is well combined. Simmer the mixture for 20 minutes, stirring frequently. 3. Remove from heat, stir in the vanilla, and allow to sit for 10 minutes. Serve warm or refrigerate to serve chilled. OMG – good story! Or at least its fun to read 🙂 Hope yer body is ok . . .
Oh my goodness! What a horrible, crazy story! Maybe one day you will be able to see the funny side and it will become a famous party story? I am sorry! I am with you on the tapioca pudding–I love it! I have never made a vegan version, though, so it has been years since I have had it. Would adding another Ener-G egg to the recipe above produce your thicker version? I really like thick puddings! excellent story – glad it ended well, thank goodness for Ibru and baby oil!!! Did you keep the section of carpet? I would like to be covered in tapioca like you were covered in carpet glue. Sign me up and call me Sally. Tapioa bath-o-plenty. Okay, Dan’s comment distracted me too much that I have no idea what I was going to say now. Glad you’re okay and belly happy! GF – My body is healing, though some black and blue mark remains … I think they make me look gnarly. Adding the second tablespoon of Ener-G mix to the pudding will give you a really nice, thick pudding. I just added the Ener-G powder to the soy milk, no water. Stina – The carpet is sitting right outside as I type. madcapCupcake – I hope that you enjoy some tapioca soon! hahahahaha i love it! i am so that person that laughs first and then asks if you are OK. i know a good person does it the other way around but man nothing cracks me up more than people tripping or falling in hilarious situations. i am so evil. but i am glad you didnt hurt anything permanently….well maybe your pride. You’ll have to let me know if the conversion to vegan tapioca was a success! So sorry to hear about your mishap but it’s great that you could laugh about it. I laughed with that visual in my mind of the carpet stuck to you as you got out of the car. I guess that the great thing is that we got a wonderful tapioca recipe out of it. Much appreciated. Thanks for this lovely recipe. I just tried it out this evening and it tastes lovely! I just made this with instant tapioca so It only took 5 min. to cook and wow! This is really really delicious. I added some frozen mango and banana after cooking and it is soo good! Thanks for the recipe. 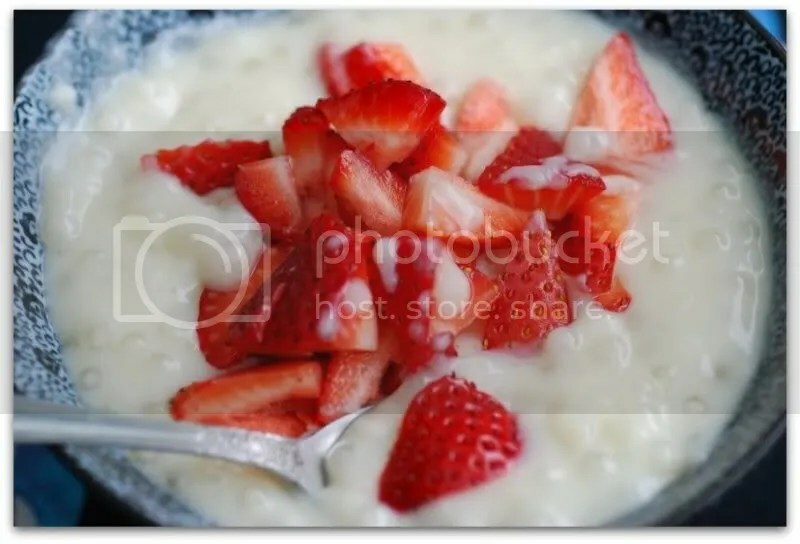 that was a great story, and the recipe sounded great, too, but when I tried it, the tapioca was still chewy and hard in the centers, not done (and I even simmered for longer than 20 min in the second step). I added water, brought to a simmer again for 30 min or so, then turned it off and let it set overnight- still chewy and not done (the tapioca, I mean- I had pretty much undone the “pudding” part by adding water, but I was just curious to see if that tapioca would ever soften- nope). I should have guessed- every other recipe for large pearl tapioca says to soak overnight- how on earth did you get them to soften using this recipe? So funny! Kind of stuff that happens to my son too.